There’s an exciting initiative underway in Marietta that is laying essential groundwork for effective strategic planning here in our little river town! The goal of a Borough-sponsored project, funded, in part, through the Lancaster County Conservancy’s Susquehanna Riverlands grant program, is to find out the best ways to leverage the Northwest Trail as an asset for building a stronger community and economy. It is important to get as many stakeholders as possible to weigh in on their personal wishes for the community in order to build a shared vision for Marietta. Part of the effort – led by the Our Marietta Planning Team – is devoted to three separate surveys: one for trail-users, one for business owners, and one for residents. What are Marietta’s most pressing needs and goals – both for our residents and the increasing flow of visitors on the trail and in town? The Planning Team has been working diligently under the guidance of three consultants seasoned in community-building and survey development: Rebecca Denlinger, Pamela Coleman, and Ben Craddock. A website /blog that will facilitate communication between all stakeholders, and advisers on the county and state level, is currently under construction and can be accessed at www.ourmarietta.com. The plan calls for trail surveys to be done seasonally throughout 2017 beginning in late February. The Planning Team will be personally distributing a Resident Survey to all Borough residents in Spring, 2017. The survey will also be online for access by residents. This survey seeks to understand what the residents of Marietta want and what they will support in terms of community and economic development. Business Owner Survey The planning team will be sending (via mail and/or email, where possible) a business owner survey to all Marietta Borough based businesses in Spring 2017. The surveys are intended to gather basic information about the business, as well as the type of support borough businesses are interested in to allow them to grow and prosper. The surveys will also look to understand how (and/or if) Borough businesses are leveraging the growing heritage and eco-tourism of the region. 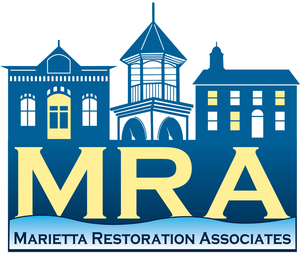 Our Marietta will be holding small group discussions with community based organizations active in Marietta. By understanding the goals and objectives – as well as planned projects and programming – of each organization, the committee intends to build a database of community initiatives that will allow for information sharing and collective resource development. Building on the earlier work of the surveys, Our Marietta will hold focus group meetings with local business owners. 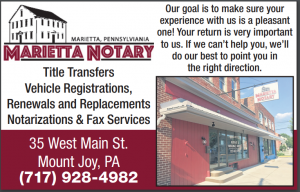 The committee will seek to understand the needs of local businesses as well as the types of new businesses that the community could look to encourage to locate in Marietta with an eye to both residents and trail users. Our Marietta will hold a community-wide event to engage residents in an activity to get them to look at the Borough from different perspectives. Participation by residents of all ages, employees, business owners, visitors will be necessary. After a focused walk about town, the groups will gather to discuss their thoughts and impressions. From this discussion the committee will determine what the participants aspire for the future of Marietta in terms of living, working, raising families, and improving their community. This event is tentatively scheduled for June 11 with a rain date of June 25. Check www.ourmarietta.com periodically for announcements and updates. The final product of all these efforts is to create a grass-roots inspired strategic plan to guide Marietta Borough Council and its community partners in their efforts to improve the quality of life for residents, the visitor experience for trail users, and the business climate throughout the Borough! Next Post: What To Do About Those Pesky “Marietta Eagles”?